Your quest, if you choose to accept it, is to take part in physical and mental challenges for the ultimate out of office adventure, in the stunning Kielder Water & Forest Park. Your team will compete with like-minded businesses from across the region in a series of instructor led water and land based challenges. 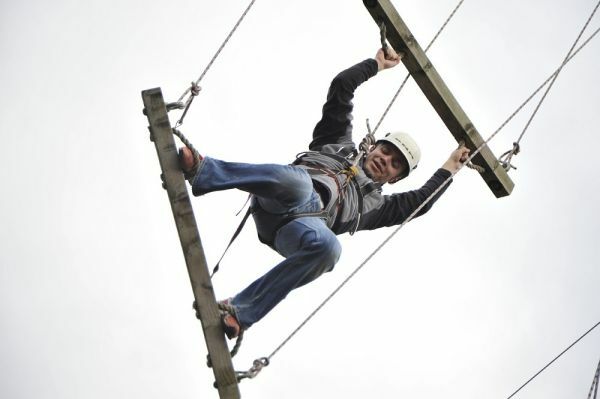 Raise funds for Calvert Trust Kielder and help to give disabled people and their families life changing experiences through the challenge of outdoor adventure. We want people to really love life, to delight in new experiences and to gain reward from being challenged. Your team of six intrepid adventurers will head to the centre for a freshly prepared meal before tackling your first challenge. Then relax, unwind and get to know your opposition over a few drinks in the bar before heading to bed in your shared accommodation. Your team will build up their strength with an early breakfast before the day’s challenges begin. A short break for lunch then back to the task in hand. A drinks reception followed by Indian buffet and awards presentation awaits at the end of an exhilarating day. Contact Hazel Ditchburn on 01434 250232 or email hazel.ditchburn@calvert-kielder.com to enter your team.